New Oldham boss Paul Scholes enjoyed a winning start to his managerial career as his side ran out 4-1 winners in the Sky Bet League Two match against Yeovil at Boundary Park. The 44-year-old former Manchester United and England midfielder was officially unveiled at his hometown club on Monday. The Latics produced the required response on the pitch, as Jose Baxter put the home side in front during first-half stoppage time. Callum Lang then headed home the second early in the second half before Bevis Mugabi pulled a goal back on 54 minutes following a free-kick. Mohamed Maouche put the result beyond doubt on 88 minutes, and there was still time for Christopher Missilou to volley in a fourth, with the impressive victory moving Oldham up to 11th place. Chuks Aneke came off the bench to score a late winner as MK Dons boosted their play-off hopes with a 1-0 victory at Newport. Former Arsenal striker Aneke struck with two minutes left, lifting the Dons up to fourth and four points off second-placed Bury. 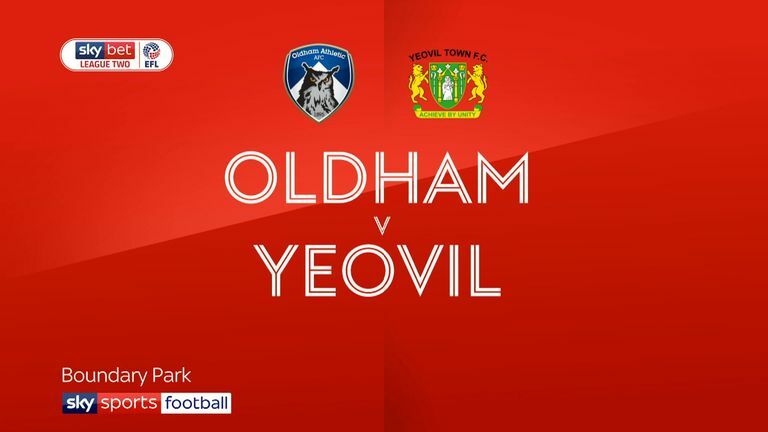 Highlights of the Sky Bet League Two match between Oldham and Yeovil. Forest Green saw their play-off push dented with a 2-0 defeat at Swindon, a second loss in the space of four days after losing at home to bottom club Notts County on Saturday. Kaiyne Woolery broke the deadlock on 36 minutes after being set up by Theo Robinson, with the on-loan Southend striker - making his home debut - then on the scoresheet himself just before half-time. Carlisle's play-off hopes were also dealt a blow with a 2-1 loss at Crewe. The Railwaymen raced into an early lead when Chris Porter scored from close range after just three minutes. The visitors were then reduced to 10 men when striker Jamie Devitt was shown a straight red card following a clash with Crewe defender Perry Ng. Although Gary Miller equalised on 29 minutes, Crewe made their advantage count when substitute Shaun Miller grabbed what proved to be the winner with 17 minutes remaining.